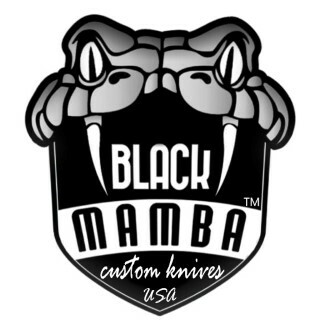 Black mamba Premium and Luxury made knives page is being put on the web site not only for your viewing but to inspire you. I want to show you that your vision to own a custom created knife can come true. These creations were sent to me as an idea from a customer and I made it come true for them. We all have a bucket list to do and dreams of what we want to own. Gaze at my creations that all started as an idea and send us your drawing or picture and changes you want. Choose a metal Damascus, D2. 440C, or 1095 High Carbon and a material for your handle and last an overall length. I will do the rest and create a stunning knife for you. Most custom orders take 4-8 weeks depending on your choices. See why I got a great review from a magazine and make a Black Mamba Custom a reality.